Outer Material: G-1000 Lite Eco , 65% recycled polyester, 35% organic cotton. First impression? "These don't look like jeans!" I'm thinking they look more like a nice pair of casual pants that I could wear almost anywhere! Well, maybe not "anywhere" - like maybe not to Mizuna (restaurant) in Denver, but certainly shopping, visiting friends, casual business appointments, etc. And I'm going to wear these backpacking? Scrambling through the rocks? Kneeling in the dirt while setting up a tent? Yep! I am! First off, they are very constructed with very sturdy material. It's almost a bit stiff. The pants actually have (front) creases down the legs! There are two front slant pockets and two rear pockets. These pockets are deep, too. Eight and 1/2 inches (21.6 cm) deep for the front pockets and six inches (15 cm) deep for the rear ones. The rear pockets actually have a "fold" at the bottom of the pocket with allows the pocket to expand outward a bit. Plenty big enough for my Samsung Galaxy S4 cell phone. There are belt loops for the waist which closes with a single metal button atop the five inch (12.7 cm) nylon zipper. Seams are all top-stitched and the leg seams are double-stitched as well. There is a one and 1/2 inch top-stitched sewn cuff. Two very small details break up the solid black material. One is a less-than-one-inch square Fjallraven logo - the artic fox and the other is thumbnail size Swedish flag. Very discreet! The quality of the Greenland pants is excellent with no dropped or uneven stitches, loose threads, pulled or snagged material. The zipper opens and closes smoothly. Despite three decent-sized soft cloth tags on the left side seam with lots of information in lots of different languages, the only care instructions I could find were the international care symbols. No words in any language. I needed to use a magnifying glass and then Google the symbols to find out what I'm supposed to do with these pants once they are dirty. And I definitely expect to get them dirty! Anyway, according to Wikipedia, I'm to wash the Greenland jeans at or below 40 C (104 F). I'm not to use any bleach. The pants should not be tumble dried in a machine but rather air-dried. I should iron the pants at low temperature. (goodness, I hope not). And, lastly, the pants should not be commercially dry cleaned. I've always said that the only thing worse than trying on and buying a pair of jeans is trying on and buying a bathing suit. And buying jeans without trying them on, well that's just plain nuts! So, it was with great in trepidation that I crossed my fingers and sent in my request for women's size 38 (!) pair of Greenland Lite jeans. The horror of the sound of wearing at size 38 was lessened by the realization that it's only a size 6-8 US. Whew! As it turns out, the size 38 is a tad big around the waist, very loose in the thighs and down right way long in the legs! I will easily be able to wear the pants with base layers should I need to do so. I, most likely, will compensate the waist looseness with a belt, no big deal there. And I like the freedom of movement in the legs. I can comfortably bend, squat, and stride without any tightness in the crotch area or anywhere else. Where I do have more of a problem is in the length of the legs. The cuff is a little over one and 1/2 inches (3.8 cm). I need to turn over that cuff twice to avoid tripping on the hem or having the dreaded bunched up rolls of fabric around my ankles! Since I don't know how much, if any, the Greenland jeans may shrink, I will not be making any permanent adjustment to the cuffs for now. I will simply roll them up and see how it goes. I almost always wear long pants on the trail, backpacking, hiking and camping. I hike in dry dusty conditions most of the time with lots of prickly things that just love to reach out and snag some skin. I'm also a bit of a klutz and tripping over a rock or tree root while trekking in the wilderness is not an unusual ocurrence. I've found that long pants covering my shins is a good thing and saves on bandages! I am so excited to be able to try out these Fjallraven Greenland Lite Jeans! They look amazing and I'm hoping they function as well as they look. I'm headed to Utah in a week for a week of exploring the Cedar Breaks National Monument. I have worn the Fjallraven Greenland pants a total of 5 tdifferent imes over the last two months. Very few of those miles/kilometers were in my home stomping grounds around Fremont County. On the two occasions I wore the pants, it has been on exceptionally hot summer days in Fremont County with absolutely no rain. Daytime temperatures never went below 90 F (32 C). I also wore the Greenland pants (3 days in a row) on a one-week base camping trip to the Cedar Breaks National Monument in Utah in early June. 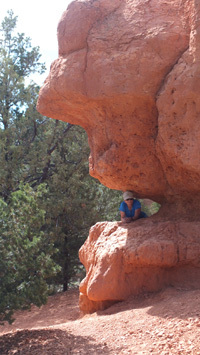 In Red Canyon near Bryce Canyon National Park where it was - again - very hot in the mid-90s F (35 C). The trails there were well-worn, wide, up and down paths through spectacular red rock formations. VERY dusty as well! Rampart Trail in Cedar Breaks National Monument. It was slightly cooler - 86 F (30 C), windy but very sunny. The trail traversed narrowly along the top of ridge overlooking the very-far-down canyon bottoms. 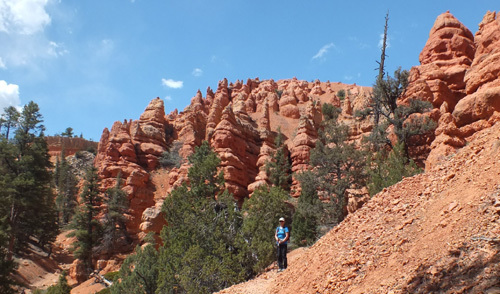 Other trails I trekked in Utah included the Valentine Peak Trail in Parowan, the Twisted Forest and the Cascade Falls trails in Dixie National Forest. Weather and trail conditions were pretty much the same as the above two. I had initially washed the Fjallraven Greenland pants prior to packing the up for my trip to Utah. I wanted to see if they would shrink at all (they didn't) and also to see if the fabric would "soften" up a bit (it didn't). Since the pants were a bit big for me, I needed to make some adjustments. Because I forgot to take a belt, when I first put the pants on, I was uncomfortable about the looseness in the waist. However, once I had a backpack on and the waistbelt cinched, I more or less forgot about that. I had rolled up the hem of the pants twice and that settled the length issue. The folded up pant legs stayed folded up, too. On the Red Canyon and the other trails in the Cedar Breaks National Monument region, the pants were rather hot - black is probably not the best color in extremely sunny high altitude climbs. Had I packed other pants, I most likely would have opted to wear them rather than the Greenland. BUT, what was a negative during the day turned into a positive at night when the desert temperatures plunged and the winds chilled my exposed skin. The tight weave of the Greenland material totally blocked the winds and kept me nice and toasty on a hike at midnight up Brian Head Peak to check out the stars. The cut of the pants was very comfortable fit-wise to hike in. I never had any chafing for tightness in the crotch or behind the knees to distract me from the fantastic scenery! A lot of my trekking was in red rocks and red rocks mean red dirt trails. Those red rock and dirt trails translate to dusty, dirty red-streaked pants. Again, black probably wasn't my best choice! I was able to brush off most of the dirt. But after three days - especially after climbing into "The Old Man's Mouth" for a picture - the pants looked rather dingy. A turn in the washer took care of that. Despite me forgetting to take the pants out of the rest of the clothes before tossing the bundle into the dryer, the pants look no worse for the wear. Next time I will have to remember the pants need to be "air-dried"! These are very sturdy pants! I've yet to tear them on errant vegetation or rocks. No loose threads. No snags. I am very happy with the quality so far! As I indicated, it's been very hot here in the west. Every place I have gone to experience outdoor adventures has been hot. Colorado. Utah. New Mexico. Arizona. All hot! The heat has definitely put a damper on my Fjallraven Greenland Lite Jeans outings! BUT, we are over the "hump" days of summer - yes, I know I still have August but the usual monsoon weather should start soon and things get better. Usually. I'm really planning (fingers crossed) on lots more backpacking trips with the Greenland jeans, starting with my "girls only" sections backpacking trips on the Colorado Trail next month! In backpacking/hiking/fishing/base camp settings, I wore the Greenland pants on two separate trips for a total of five more days. I also wore the pants three more times casually around town and on a flight to Florida. It's been a super, super hot summer! For the past several months, daytime temperatures have rarely been under 90 F (32 C) and more often than not, they have been over 95 F (35 C). Toasty! 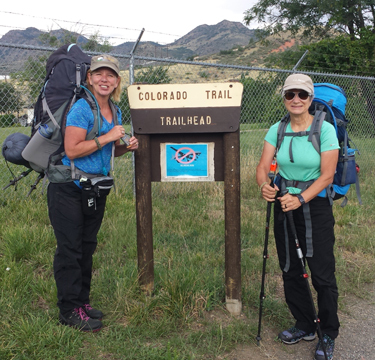 We have had very little rain, except, of course, the three days my daughter-in-law, Julia, and I were backpacking on the Colorado Trail! Then it drizzled a bit each afternoon and downright poured each night! 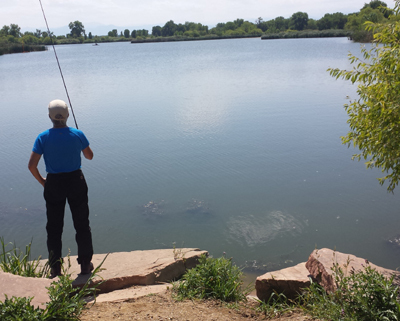 St. Vrain State Park for a base camp on a long-weekend of fishing in Pelican Pond near Firestone, Colorado. Elevation: 4970 ft (1.5 km). It was warm during the daytime, but cooled off nicely to a low of 55 F (13 C) at night. While there was no precipitation, it was mildly windy, enough so that I woke up from the sound during the night. Colorado Trail, Segment 1 (Kassler to South Platte Canyon), 16.8 miles (27 km), elevation 5520 ft - 7280 ft (1.7 km - 2.2 km) for an approximate 2160 ft (0.66 km) elevation gain. Temperatures were in the low 90s (32 to 34 C) during the daytime with intermittent light showers and blazing sunshine. By night fall, we had pretty steady rainfall until dawn. I come to really appreciate the stellar quality of these Fjallraven Greenland Lite Jeans! They are ridiculously sturdy enough to handle rock scrambling, but still perfectly presentable to wear for casual occasions when I want to look nice. I've worn them fishing and I've worn them when I had to spend 12 hours traveling through various airports! And they worked wonderfully in both settings. While on a base camp fishing trip, I was pleased to find that water didn't readily penetrate the Greenland pants - I'm a very sloppy kayaker and pond water seems to gravitate to my pants! After several hours, the pants did get a bit damp but in the heat of the day, I was amazed at how quickly they dried. As heavy as the fabric is, I was anticipating a wet evening drying out at a camp fire. No need, by dinner time, all was dry and I was, again, able to value how the tight weave keeps out the wind. This water-resistance also came into play on my backpack on the Colorado Trail. Each afternoon, we encountered light drizzle and while we did don rain shells, it was just too hot for me to bear putting on rain pants as well. The Greenland jeans never did get wet through while hiking but did get rather soaked one night when the pants were up against the tent vestibule wall. Even after getting soaked that one night, hanging the jeans on a tree limb was sufficient for them to be wearable by the time we ate breakfast and broke up camp. Because I will always sacrifice clothing pack space to food, I tend to wear the same pants throughout a three-day backpack. The Greenland pants held up great to that challenge and while they were a bit - ok, more than a bit - dirty by the end of my trekking, they really didn't stink (did they, Julia?)! They were, though, immediately tossed into the washer as soon as I took them off! Sorry to say, I just can't seem to get the knack of removing them from the rest of the wash before stuffing the load into the dryer. Happy to say, however, that I don't see any detrimental effects as of yet. I need to put a Post-it sticker or something on the dryer! Despite the, for me, stiffer-than-usual fabric, the Greenland Jeans are very comfortable to hike and actively move around in. The cut of the pants also makes it comfortable on long plane flights when sitting for hours can expose the flaws of a too-tight crotch seam. I never had any chafing, even when backpacking for 6-7 hours at a time. Now that the field evaluation period is over, I will have the hem taken up on the pants so I am not rolling up the cuff. And while at the beginning of the field evaluation, I planned on taking in the waist, I've decided not to do so. I still need to wear a belt with the Greenland Jeans, but that's ok. I'd rather a bit of room versus a bit of snugness. I think the Fjallraven Greenland Lite Jeans are great! They are the perfect pair of pants for casual outings when I want to look nice and spiffy but not too dressed-up. They are almost too pretty for the real outdoors! Yet they do hold up admirably in grubby situations as well. I like the style quite a bit. The fabric and workmanship is of high quality and is very protective against wet and/or harsh enviroments, such as rain, sunshine, rocks, scratchy vegetation, etc. I do think the black fabric is too warm in the summertime though. Thank you to Fjallraven and BackpackGearTest for the opportunity to try out these snazzy, not-your-mom-jeans pants!